AllegroMedical.com presents The Baseline® Dynamometer. 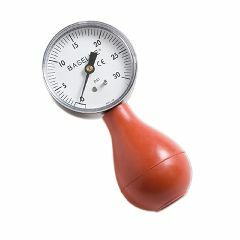 The Baseline® squeeze (bulb) dynamometer is the inexpensive way to reliably measure hand and finger strength. The dynamometer is available with and without a maximum force indicator (reset) that remains at the maximum reading until reset. Unit is calibrated in PSI (pounds-per-square inch). The Baseline® pneumatic bulb hand dynamometer pinch gauge combo measures both grip and pinch strength. Three different sized (1", 1.5" and 2") interchangeable squeeze bulbs are fitted to the gauge. Lightweight and portable. Maximum reading remains until reset. Unit is calibrated in PSI (0-30).Similar to the Martin Vigorometer.